Which Of These National Historic Landmarks Is Dedicated To Thomas Jefferson? If you scrutinize the cast list of the first pilot episode of Star Trek: The Original Series, completed in 1965, you won’t find a whole host of famous Star Trek names. There’s no Captain Kirk (William Shatner), Sulu (George Takei), McCoy (DeForest Kelley), or any of the faces that people would associate with the iconic franchise. None that is, save for the calm visage of one Mr. Spock, then and forever immortalized by actor Leonard Nimoy. 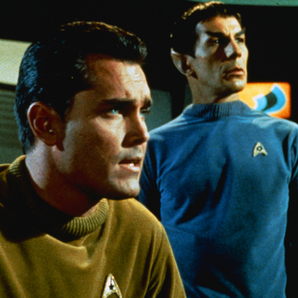 In the first pilot episode, the captain of the Starship Enterprise was played by Jeffrey Hunter and named Captain Christopher Pike (later, the 2009 Star Trek reboot would pay homage to the pilot episode by including Christopher Pike as the first captain of the Enterprise who inspired Kirk to enlist in Starfleet). The rest of the cast is largely uncredited, playing minor roles, save for a handful of actors and actresses like Susan Oliver (who played the role of Vina) and John Hoyt (who played Dr. Phillip Boyce). Among the entire credited and uncredited crew, the only notable actor to survive the transition to full-time filming was Nimoy. The only other notable Star Trek actor or actress that appeared in the pilot was Majel Barrett, Star Trek creator Gene Roddenberry’s “future” wife, who would make various appearances in the Star Trek franchise over the course of her life, including providing the iconic voice for the ship’s computer in multiple Star Trek films and TV series.